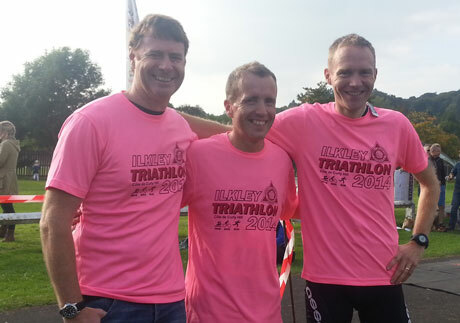 Following previous near-misses, Radio Design’s team [“Three Men in a Tub”] finally finished on the top step of the podium in the Ilkley Triathlon. This unique event, held on Sunday 21st September and consisting of a 500m pool swim, a 14.5km cycle and a 4.8km run, can be entered by both individuals and teams. Indeed, previous individual winners include Yorkshire’s favourite sons Alistair Brownlee (2003 & 2004) and Jonny Brownlee (2005). Radio Design’s team [Eric Hawthorn (swim), Darren Midgley (run) and Martin Gostling (cycle) – Left to right in photo] not only won the team competition, but also managed to post the event’s best overall time outright, 56:33:25; an outstanding achievement!